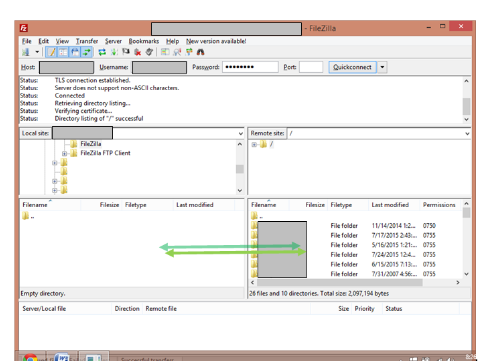 FTP Client - FileZilla Tutorial | The Daily Programmer '+g+"
Step 2. Install according to instructions in the setup wizard. Once finished, launch filezilla. Click on quickconnect or hit enter. The left one is your local computer: in the local site type the path where you want to work, or click the down arrow to browse a folder on your site. The right side is the live server: Any change you make here will immediately be reflected on the actual site, so be careful. To transfer from the server to your computer, drag the files you want to transfer from right column to left column. To transfer from computer to server, drag the files from left column to right column. Note: Before you make any changes, the first thing is to create a backup. Simply drag all the files from right column to left column (your computer) and create a temporary backup folder. Do this everytime you login, because there might be changes made by other users. Why this step is important: If you accidentally modify a different file or upload directly on the live server or something goes wrong in between, the site may go down (worst case scenario). This is when your backup folder saves the day. In the right column select the folder containing your file. Double click on the file. 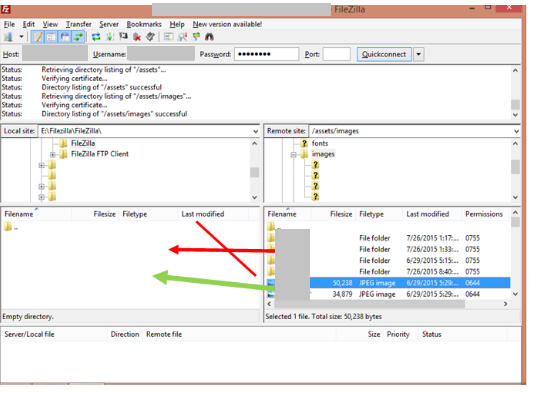 Drag your file into this folder as shown in the image above. Your file is uploaded successfully.